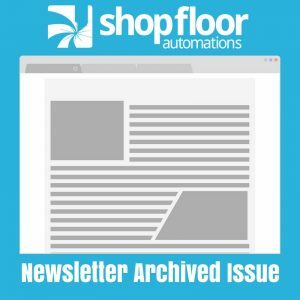 Archived copy of the Shop Floor Automations Newsletter – May/June 2015. Replace your floppy disk drives and media with USB solutions. Our proven solution works with a variety of machines and equipment that use 1.44MB floppy disk drives. All documentation and technical support are included to allow for a quick upgrade. Simple to install using existing ribbon cable and power cable. No modifications needed to your machines or special software required. Are you still using Windows Server 2003 in your facility? There are some things you need to consider. Microsoft is ending support for Windows Server 2003 on July 14, 2015 which means no new security updates, hotfixes, assisted support options, or updated technical content. Among other challenges, businesses will face increased risk from cyber-attack, and lack of PCI compliance. Windows Server 2003 end of support opens the door for new opportunities to introduce your customers to cloud and hybrid-cloud IT. Most companies now using Windows Server 2003 plan to migrate to a newer version of Windows Server, and many are considering cloud options. Join Shop Floor Automations and our partner Scytec Consulting for a webinar on a useful tool to monitor the efficiency of your shop floor. Did you miss our webinar on Plant Maintenance Management software? See a demonstration of the highlighted features in this video at your desk or on your mobile device. We have been serving our customers since 1998 and expanded our product lines. While we have been recognized as the number one reseller for Predator Software for many consecutive years and known for wired and wireless DNC, check out our other product lines. We specialize in machine monitoring, plant maintenance and job scheduling software to improve the work flow and processes throughout the shop floor. Contact us today for a free consultation on how we can help build a better partnership with you.